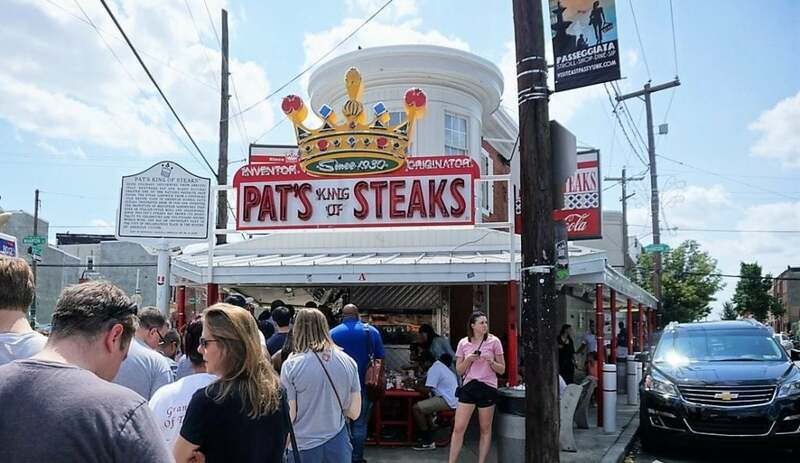 Pat’s and Geno’s are both famous for their cheesesteaks. A cheesesteak is a sandwich with thinly sliced pieces of beef and melted cheese in a long hoagie roll. The meat traditionally used is rib-eye or top round cooked on a griddle. It is common to have grilled onions, mushrooms, and peppers on your cheesesteak. The peppers can be either hot or sweet. First, you will need to decide what type of cheesesteak you would like to have. You can choose your cheese and also whether or not you want onions. We decided we should try onions on the cheesesteak. For cheese, I wasn’t sure the best cheese for a cheesesteak. We ended up chosing cheese whiz, a processed American cheese spread, since I think that is the traditional Philly cheesesteak. If you prefer, you could also have regular American cheese or provolone. They also make cheesesteaks without cheese, but is that really a cheesesteak? Ok, so now you know what you want to order. From what I read, I thought they were very particular about how you order your cheesesteak. You are supposed to say which cheese you want and then if you want your cheesesteak “wit or witout” onions. So I think I should have said, “I want a cheesesteak whiz wit.” I was worried I would get yelled at for not ordering it correctly. Lucky for me, that didn’t happen and I still got my cheesesteaks even though I don’t think I ordered the ‘right way’! Yes, there are other sandwiches on the menu at both Pat’s and Geno’s, but if this is your first time, shouldn’t you try the sandwiches that made them famous? If you are extra hungry, you may want to try the cheese fries though. Our first stop was Pat’s King of Steaks. Pat’s King of Steaks was founded by Pat Olivieri back in 1930. It actually started as a modest hot-dog stand right by the famous Italian Market in South Philadelphia. One day Pat decided to try something different for lunch and got some chopped meat from the butcher shop. He cooked the meat on his hot dog grill, then put the meat onto an Italian roll, and added grilled onions. One of his regular customers saw the sandwich and insisted that Pat make him one as well. “Hey…..forget ’bout those hot dogs, you should sell these.” And that’s how the cheesesteak was born. It wasn’t until years later when employees and customers wanted a change that cheese was added to Pat’s cheesesteak recipe. So we decided to start the taste test with Pat’s since it is the original Philly cheesesteak. The line looked a little intimidating but it did move pretty fast. We waited less than 10 minutes, although part of that was in the intense sun. I ordered my cheesesteak whiz wit and handed over my $11. They only accept cash. Before I knew it, I had the Pat’s Philly cheesesteak in my hand. It was bigger than I expected. Pat’s Philly cheesesteak must have been at least a foot long. Since they are trying to keep the line moving, they have to make the cheesesteaks quickly, so they are not big on presentation or making sure the cheese is spread evenly throughout the sandwich. There is a station for condiments that also had some peppers. I decided we would try the sandwich just as they made it, but picked up some peppers to have on the side. There is a dispenser for napkins, but that was by the ordering window. Once we had everything, we went to sit down. After doing a loop around the place, we realized there were no seats available and we would have to stand. I should also mention there is no inside seating at Pat’s (or Geno’s for that matter). It was fine, we were excited to finally try the famous cheesesteak. Let me tell you, it did not disappoint. I was surprised that the Philly cheesesteak from Pat’s was not greasy at all. It tasted delicious. My only constructive feedback was that it would have been nice if they would have spread the cheese a little more evenly throughout the cheesesteak. Then, we went to Geno’s, the other half of the famous Philly cheesesteak rivalry. Philadelphia native Joey Vento founded Geno’s in 1966. He only had two boxes of steaks, a few hot dogs, and $6 in his pocket when he opened his shop at 9th and Passyunk. But it wasn’t long until the business was booming. When Joey had a son in 1971, he named him Geno. As soon as he could, Geno started learning about the family business. From age 17 on, you could find Geno at the shop, making steaks, taking orders, and getting to know the customers. When Joey Vento passed away in 2011, Geno took over the shop and is carrying on his father’s legacy by serving up Philly’s famous cheesesteaks. Geno’s does have a devout following as I noticed a memorabilia shop across the street. There is also an intense rivalry between Pat’s and Geno’s. It was funny when we were there a group that came in and one person had a sandwich from Pat’s. The staff immediately noticed and asked them not to bring that sandwich in. We learned our lesson from Pat’s and Russell went to find a table, while I stood in line. It was nice that they curve the line so that I was in the shade the whole time. Like Pat’s it moved pretty quickly and I had my cheesesteak in less than 10 minutes. They also have a similar setup where you can get condiments and peppers for your cheesesteak. Then, it was time to taste the other famous Philly cheesesteak. No surprise, it was delicious and you could tell they use high-quality ingredients, just like Pat does. However, there is definitely a difference between the two! You can get a delicious authentic Philly cheesesteak at both Pat’s and Geno’s. While it was a tough call, we ended up with a unanimous decision on where to find the best Philly cheesesteak. 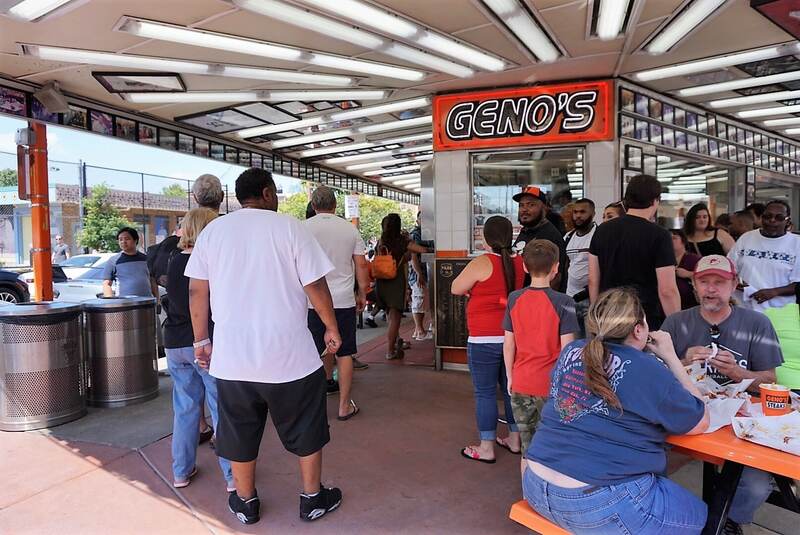 Check out our video to find out the winner – Pat’s or Geno’s? Pat’s and Geno’s are located caddy-corner from each other close to the Italian Market in Philadelphia. You can take the bus line that goes along 9th street to get there or it is about a 10-minute walk from the Broad and Federal Street subway stop. We took an uber from the historical area since we were short on time and it costs us about $7. If you are driving, there are several parking lots you can use. Note: While you are in the neighborhood, it’s worth visiting the Italian Market too. It’s a great place to experience America’s diversity. Have you tried one of the famous Philly Cheesesteaks? Which one is your favorite? You will need cash for your cheesesteaks – neither shop accepts credit cards. Both shops only offer outdoor seating, so be prepared for the weather conditions. Don’t stress too much about ordering your cheesesteak. I didn’t do it exactly right, but I still got what I wanted. If you want to sit down, have one person in your party scope out a table while you are waiting in line. NextPhiladelphia Mural Tour: Street Art That Changes Lives! OMG watching your video made me SO hungry! They both looked so enticing. The intense rivalry anecdote made me smile. Tough competition! This is embarrassing to admit, but although I’ve heard tons of about Philly cheesesteaks (naturally), I never realised that they’re basically meat in a hot dog bun (with cheese)! Would definitely try both out if I ever visit Philly. Michelle – Haha they are good. The bread is more like a sub roll than a hot dog bun. I do hope you get to try them! Ruth – Sorry you didn’t have a good experience. That is really interesting. I got my info from the food network, it will be interesting to hear what other people say too. I do think the onions really make a difference. I also wanted to try the provolone but thought we should order the same thing at both places so we could do a fair comparison. OMG I would love to try both cheesesteaks! Never had the originals before! If there’s a line, it’s always worth the wait in my opinion! #TheWeeklyPostcard! Lolo – Yes you need to try them. Luckily these lines move pretty quickly. Really enjoyed your video!! Made me want to grab on of those right away! Being a cheese lover, I was literally drooling! Definitely going to try both places whenever I visit Philly! Meghna – Glad to hear you enjoyed the video! Yes both cheesesteaks are delicious so I hope you get to try both of them! Great post! Honestly, I want ALL the cheesesteaks, they look so good. Kareemah – Thank you! Yes, they are both delicious. I hope you get to try them. I’m from the Philadelphia area. Ironically, I’m actually not a huge cheesesteak fan lol. Between the two, I’ve only eaten at Geno’s. cheesesteaks here are generally really greasy so Pat’s may be better option for those who want to avoid that. Nicole – That is funny! Yes, I think you should try Pat’s. Is it terrible to say that the look of Philly Cheese steaks kind of turns me off straight away? I’m not a massive meat eater, which may be the problem. But maybe it’s time to bite the bullet and give it a go! Katherine – Well Philly cheesesteaks really are about the meat, so that’s understandable. Maybe you might like the cheese fries better? A very important post! Personally I like the roast pork sandwiches in Philly better than the cheesesteak, but they’re all good! Sarah – Thanks. I have not heard about the roast pork sandwiches?! Where do you get those? I was in Philly last weekend and only ate at Genos. We’d originally planned one at each but I was so full after our massive brunch we just ate the one! Hayley – Yes, they are bigger than I expected. I hope you make it back so you can try Pat’s! I have never heard about cheesesteaks neither have I been in Philadelphia. But I would only travel there for the food, I mean those steaks look amazing. 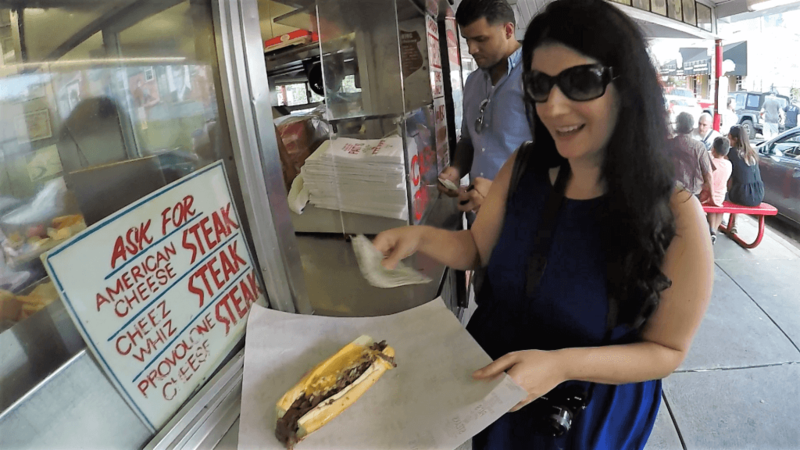 Paulina – Yes the cheesesteaks are delicious. Philly is definitely worth a visit, there really is a lot to see too. I love your taste test…we’ve been considering a trip to Philly too and this is on our list because we LOVE cheesesteaks. And of course we love to travel for food! Thanks for the tips on ordering because I’d be so nervous about messing that up! Thank you, Julie! I hope you do make it to Philly. There is lots to see in addition to the cheesesteaks (more on that coming up on the blog). And don’t worry about the ordering too much, I don’t think I got it right anyway. Ana – Haha! Did you try Pat’s too? Erin – Yes! I definitely think you should try both Pat’s and Geno’s. Shere – Yes I agree, the cheese is key! I was intimidated by the ordering too. I wanted to try the fries too but just didn’t have enough room in my stomach. Next time! You can’t beat a good cheesesteak sandwich. I miss these! Lindsey – I agree, they are so good! I went to Pat’s and loved it. I was too full to consider also going to Geno’s, however pat’s was the one recommended by my grandmother who grew up in Philly! Karen – I agree Pat’s was so good and they are really filling. Alex – Yes, next time I hope you get to try both Pat’s and Geno’s. Would love to hear what you think. Hilary – That is a good question and hard for me to answer since I didn’t try one without. Looks like the both of you made the right choice! 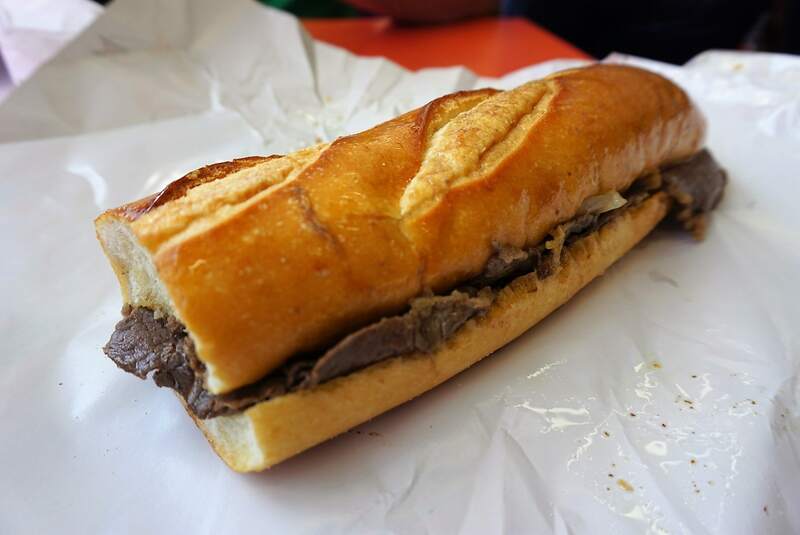 If you’re really a cheesesteak aficionado, then you might consider venturing out of the city center to try neighborhood favorites like Steve’s Prince of Steaks which I find to be tastier than both Pat’s and Geno’s. Dan – Thanks for the tip. I will have to check that out next time! This was very helpful info! Glad to know ahead of time how to order a proper cheesesteak. I will use this information the next time I travel to Philly! Annika – So glad you found the post helpful! Yummy! I’d love to try them, specially for the cheese. Thanks for sharing in #TheWeeklyPostcard. Haha, yes! The cheese is delicious. If I ever visit Philly I will be sure to try a CheeseSteak. Though from past travels to the USA I struggle with the cheese. You don’t seem to have the same nice full bodied cheeses we have here in Australia and I’m not a huge fan of processed cheese. Sally – Yes you should definitely try them. You might prefer provolone if you don’t want processed cheese. I hope you get the chance to try a cheesesteak. I really loved them. We were on a 1 day long layover in Philadelphia last June and landed at around 7AM. The first thing we did was get these cheese steaks for breakfast 🙂 Good thing they were already open by the time we got there and there were no lines. Our family also preferred Pat’s over Geno’s due to the greasy factor and the meat seemed better cut. It was interesting that after we posted our little sample taste test, a couple of friends who grew up in Philly were quick to say we shouldn’t have gone to these two places and there were better places. We wanted the ones that have been here for years and famous for them. I guess we’ll have to try the locals’ favorites next time. Mary – ha! I had no idea they open so early. Yeah, I know some people think they are toursity, but agree they are the most famous. I am going to have to try more of them next time too. Exactly, which one is your preference?